In a distant world, humankind faces extinction at the hands of a brutal enemy in the visually stunning epic Warcraft, coming to Digital HD on September 13, 2016, and Blu-ray, Blu-ray 3D, 4K Ultra HD, DVD and On Demand on September 27, 2016, from Universal Pictures Home Entertainment. Based on the global video game phenomenon from Blizzard Entertainment, Warcraft is a seamless blend of live action and awe-inspiring visual effects. All Blu-ray editions include over 90 minutes of bonus content, including deleted scenes, an exclusive stop-motion Warcraft comic, and several behind-the-scenes looks at stunts, visual effects, story origins, and more. Directed by Duncan Jones (Moon, Source Code) and written by Charles Leavitt (In the Heart of the Sea, Blood Diamond) and Jones, Warcraft stars Travis Fimmel (Vikings, Maggie's Plan), Paula Patton (Mission Impossible: Ghost Protocol, Deja Vu), Dominic Cooper (Captain America: The First Avenger, Need for Speed) and Ben Foster (Lone Survivor, 3:10 to Yuma). The supporting cast also includes Daniel Wu, Toby Kebbell, Andre Tricoteux, Robert Kaminsky, Clancy Brown and Daniel Cudmore. Warcraft only earned $47.6 million at the domestic box office, but it was a huge hit overseas, with a worldwide total of $432.9 million from a $160 million budget. Universal Pictures Home Entertainment's Blu-ray and Blu-ray 3D editions of Warcraft will include Warcraft: Bonds of Brotherhood Motion Comic, which brings the story of the film's young heroes - Prince Llane, Captain Lothar and Guardian Medivh - to life in this unique experience. The World of Warcraft on Film explores the cultural phenomenon as documented in this comprehensive multi-part feature focused on bringing the unique environs of Warcraft to film. The four-part feature includes The World of Talent, The World of VFX, Outfitting a World, The World of MOCAP and The World of Stunts. The Blu-ray bonus features also include a featurette on the making of the Warcraft wax figures by Madame Tussauds, and an early teaser which premiered at San Diego Comic-Con in 2013. 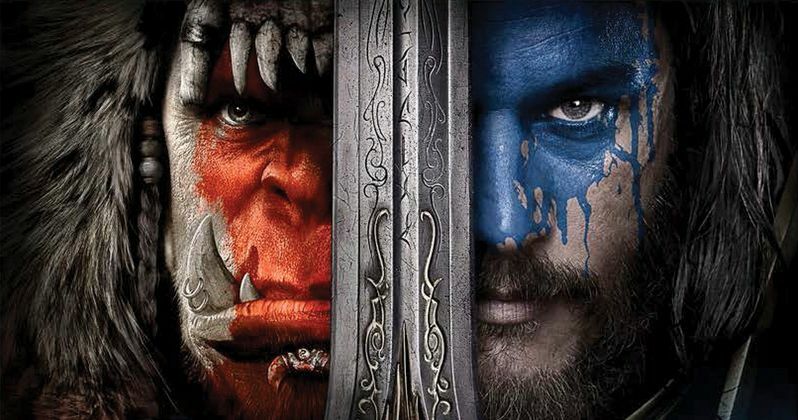 Both the Blu-ray and DVD will include Deleted Scenes, Gag Reel, Origin Story, The Fandom of Warcraft, which delves into the history and breadth of the fandom behind the game and film, as well as the way it has influenced pop culture, and ILM: Behind the Magic of Warcraft, where fans can see some of the groundbreaking facial capture technology utilized by Industrial Lights & Magic to convey the emotion and depth of the visually impressive Orc characters in the film. Take a look at the Blu-ray trailer along with the Blu-ray artwork for Warcraft below.